My excitement about achieving this milestone is only matched by the embarrassment that I have never done it before. The reason that this is my first time maxing out these accounts is that I simply didn’t know any better. I had always contributed the amount that my employer matches to my 401k and had never thought about using a ROTH IRA. This year, I finally got it together and realized what the maximum contributions were for each of these accounts and maxed them out. While maxing out the 401k that I have through my employer, I looked into how my funds were being allocated. When I signed up, I was in the standard target retirement date fund that our broker recommended to me. Looking into the fees, I realized that I had the opportunity to put the funds into a Vanguard 500 Index Fund, which carries a fee that is 1/4 of the target retirement date fund. This doesn’t sound like much, but will add up in the long term. After moving into our new house, interest rates continued to drop. About six months in, I called our mortgage company and let them know that I was going to look into refinancing. After two more phone calls and an application, they lowered our interest rate by .5%, without charging us any fees to go through the process. This saves us $225 per month on our mortgage and could end up being one of the biggest 2017 financial wins when we look back years from now. I have tried budgeting about a thousand times in my life. This year, my wife and I finally sat down and created a budget with the right “buckets” that works for us. Not only has it helped us to spend less across the board, but it has also helped us to understand key metrics like our savings rate, time to early retirement and more. This is probably our biggest win of last year. This is an app that I finally tried last year after hearing about it roughly a dozen times. I had used Mint in the past, but never really managed to stick to it because I didn’t find their user interface all that friendly. I’ve been using Personal Capital for about 5 months now and love that it gives me a daily snapshot of how I am progressing toward FI. I also received a phone call from Personal Capital when I signed up, which I found slightly annoying, but have since read that it’s a bit of a milestone in the FI community. Travel rewards (or, more broadly, credit card rewards) have been my newest personal finance endeavor. We managed to end the year with five free flights, the last of those being a companion pass for my wife from the rewards through the Southwest Airlines Rapid Rewards Credit Card. The awesome thing for my wife and I is that our Companion Pass allows her to join me on any flight in 2018 for free. Speaking of the FI community…I discovered the Choose FI podcast and Facebook group last year. I have listened to about a third of the episodes and have learned a ton. The reason that I consider this a financial win is that I have taken away a ton of actionable tips. The podcast also helps to keep financial independence top of mind throughout the course of a week, which I believe will pay big dividends in the long run. Okay, 9.7%. This is actually a loss and a win. You may notice that I underperformed the market by about 50% by choosing individual stocks. The reason that I do this is simply to remind myself that I CANNOT BEAT THE MARKET. 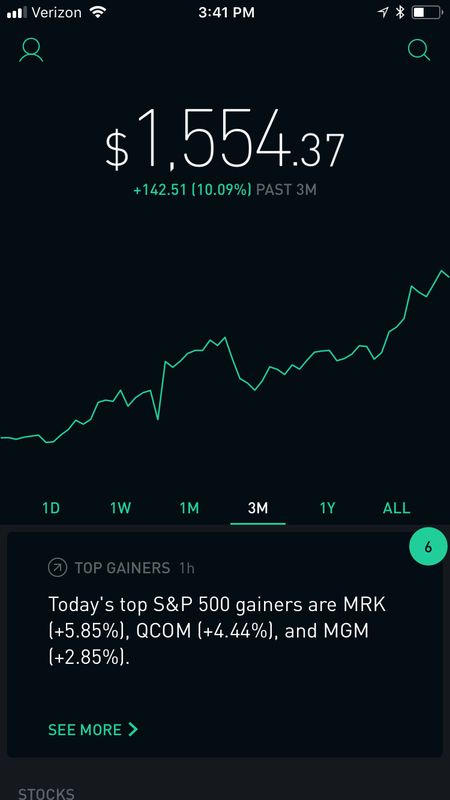 I keep a small amount of money (about $1,000) in Robinhood, which allows me to trade for free. When I feel like I have a good idea or angle on a stock pick, I do it in that account, while keeping the vast majority of my money in VTSAX. I think of my Robinhood account similar to playing penny slots or buying into a Fantasy Football league. I continue to do it to enjoy the sport of it, but also to remind myself that I am not a professional stock trader and should never attempt this with my FI money. All of that said, Robinhood is pretty awesome. Airbnb rental ($4,749.00) – we sold our house in April and stopped renting on Airbnb. Renting my car out on Turo ($1,989.00) – I stopped doing this in June when we got in the range of my daughter being born. Wouldn’t want to miss the birth of my daughter because a bike commute was my only option. * Videos and Surveys through Swagbucks ($525.00) – The majority of this was leaving video playlists running in the background on my computer to earn cash, which I’m actually doing as I write this. Pretty easy money here. * Cryptocurrency mining ($7,434.00) – This number was profit after all of my hardware expenses were paid back. I built three computers and I keep them mining 24/7. I don’t really believe in cryptocurrency investing as a long-term financial strategy, but trading electricity costs for cryptocurrencies which I can exchange for US dollars, I do believe in. * Cash back apps ($179.00) – this number probably doesn’t look huge as far as a financial win, but using eBates, Receipt Hog, Swagbucks and Paribus added a few bucks a month with nearly zero effort. My daughter was born in late August. Financial wins aside, this is the greatest joy that I have ever had in my life. It helps to give purpose and perspective to all of the financial goals that my wife and I pursue. Striving towards a net worth number now equates to purchasing back our freedom and spending more time with our family. With that as my motivation, I couldn’t be more ready to crush it in the next 50 weeks of 2018. Congratulations on the birth of your daughter! Sounds like you had a great year! I agree that the lower mortgage rate may prove to be your biggest financial win over time, but you have a lot of strong candidates for that title with the good decisions you made last year. Best of luck in 2018! Thank you for the kind words. I just checked out your blog and it looks like there’s some good stuff there. I saved a couple posts to Pocket to check out later. Have a great 2018!